Sierra Leone’s economy has been badly damaged by the Ebola crisis, as GDP, tax receipts and export revenues fall to their lowest levels since the end of the war in 2001. With international aid now accounting for almost 60% of the government’s income, there are fears the effects of the Ebola crisis may now take decades to roll back, assuming corruption and poor productivity and public sector inefficiencies can be curbed. 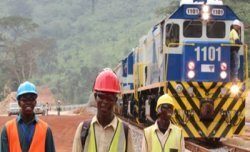 The country’s debt has grown in the last eight years at an alarming pace, as the Koroma government embarked on a misplaced priority of infrastructure development, at the expense of investing in the country’s health systems, water and sanitation, education, and pro-poor initiatives. 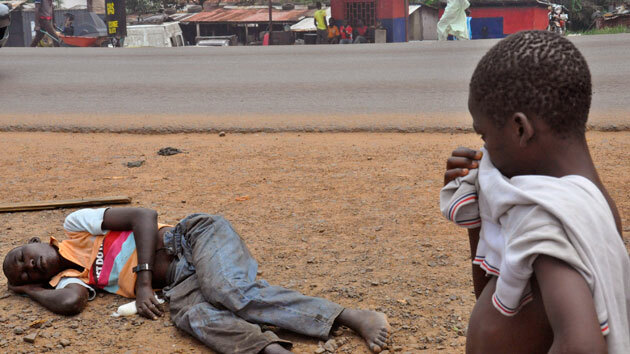 It is estimated that Sierra Leone’s debt now stands at more than $1.5 billion. The country needs over $300 million to meet its pre-Ebola spending commitment, and more than $500 million to begin the hard task of post-Ebola recovery. As hundreds of millions of dollars begin to pour into a governance system that most Sierra Leoneans describe as rotten to the core and riddled with corruption, there is an urgent need for the international community, the IMF and the World Bank to demand that the Koroma government undertake serious root and branch reform of the country’s governance and public finance management structures. This demand is most critical, in the light of the Auditor General’s report into the mismanagement of $18 million Ebola fund, as well as eight years of successive national audit reports expressing dismay at the appalling levels of misappropriation of public funds, and lack of accountability. Last month the International Monetary Fund announced the launching of a Catastrophe Containment and Relief (CCR) Fund, through which, the three West African countries worst affected by the Ebola virus, will be granted debt relief and new loan finance. Today, as heads of states of Sierra Leone, Liberia and Guinea met in Brussels to discuss a new strategy and framework for bringing the Ebola crisis to an end; and work out a roadmap for addressing post-Ebola challenges, the IMF announced that it has approved a total of $187 million for Sierra Leone. 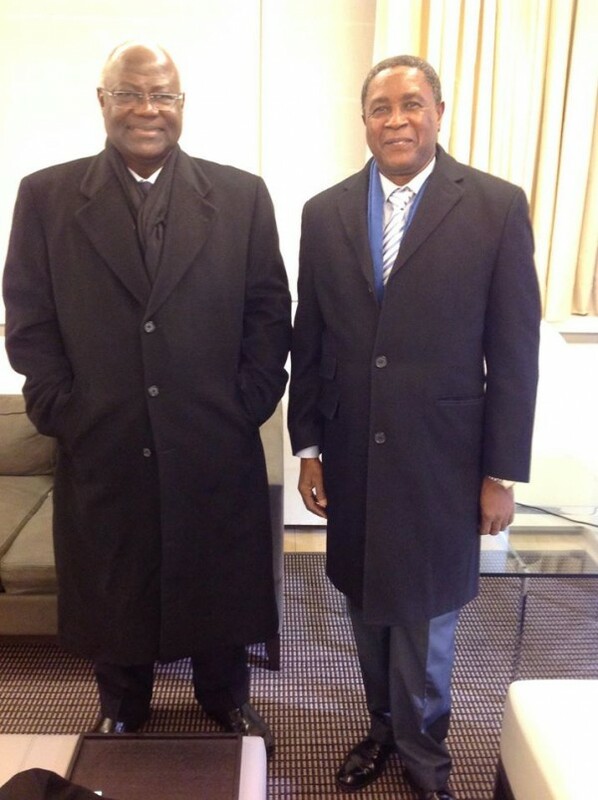 (Photo: President Koroma and his information minister Kanu in Brussels). $85.45 million will come from the IMF’s Extended Credit Facility (ECF) arrangement, as well as an augmentation of access under the ECF arrangement of 50 percent of Sierra Leone’s quota of $72.94 million. The IMF Board also approved $29.18 million in immediate debt relief, under the catastrophe containment window of the Catastrophe Containment and Relief (CCR) Trust. The IMF says that these funds will support the government’s fight against the Ebola outbreak by covering urgent budgetary and balance of payments needs, and strengthening international reserves which has been severely eroded by the declining exports revenue. The IMF is confident that this new financing arrangements for Sierra Leone, would help catalyze further financial assistance from the international community – preferably through grants. The $29.18 million will be used immediately to start repaying debt service obligations owed to the IMF. 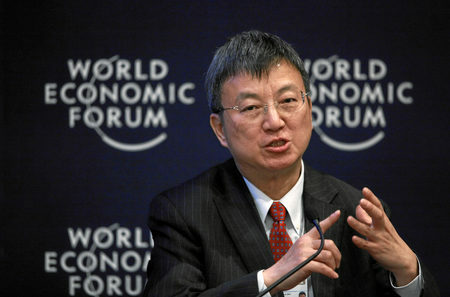 Mr. Min Zhu – Chair and Deputy Managing Director of the IMF Board said that; “The Sierra Leone economy is battling two severe exogenous shocks, with dramatic social and economic repercussions. The Ebola epidemic and the sharp decline in iron ore prices are weighing heavily on the economy and have the potential for significant output contraction, continued price pressures, and increased fiscal and balance of payments deficits in 2015. “Debt relief under the Catastrophe Containment and Relief Trust combined with augmented IMF financing under the Fund-supported program, will help cover balance of payments and fiscal financing needs, and catalyze further support from the international community. “The economic impact of the dual shock has made the 2015 fiscal objectives more challenging. Therefore, it will be critical for the authorities to continue enhancing efficiency in tax administration and to broaden the tax base to support the revenue target. “On the expenditure side, policy priorities include improving capital expenditure management, maintaining a prudent wage policy, making further progress in public financial management reforms, and strengthening budget execution to avoid accumulation of arrears. “In this regard, full resumption of Cash Management Committee meetings, which were interrupted because of the Ebola outbreak, will be essential. “Sierra Leone’s risk of debt distress remains moderate. Therefore, continued prudent borrowing policies are critical in view of the economy’s vulnerability to exogenous shocks and the fragile fiscal position. “Financing needs, particularly for large-scale investment projects, should continue to be covered with grants and concessional loans to the extent possible. “Some easing of monetary policy will help the Bank of Sierra Leone (BoSL) in supporting the economy, as long as inflationary pressures continue to be driven by supply shocks and second-round inflationary pressures remain contained. While the IMF financing approvals will be welcomed by the government, there is little doubt the need for urgent and meaningful reforms in governance, especially in the light of the deep and serious corruption that has been exposed by the Auditor General’s report into the mismanagement of $18 million Ebola funds by government officials. In the last eight years, successive national audit reports have criticised and expressed alarm at the level of corruption and mismanagement of public funds and government revenue by State officials and ministers. To continue to pump hundreds of millions of dollars into a system of governance that is as porous and leaky as the country’s borders is unacceptable. The international community – including the World Bank and the IMF must heed the call for serious and meaningful reform of Sierra Leone’s financial management and governance structures, across all of the public sector, as a prerequisite for any further financing arrangements. Rampant corruption and misappropriation of public funds, cannot be allowed by the European Commission, the IMF and the World Bank to continue in Sierra Leone. It may be tempting for the developed countries to turn a blind eye to corruption in countries like Sierra Leone, because monies squirreled out of the poor country are repatriated back into Western Banks for safe keeping by rogue officials, but it is the poor people of Sierra Leone that pay the ultimate price with their lives. Ebola has not destroyed the health system in Sierra Leone contrary to the propaganda being peddled by those who ought to know better. What Ebola has done in the last nine months is exposed the depravity of those in authority, and the effects of decades of systematic dis-investments in the country’s dilapidated and crumbling health sector. Without an urgent and serious reform of the country’s governance and public finance management structures now, in the next few years the poor people of Sierra Leone will be back where they are today – mass poverty and avoidable deaths. As president Koroma leaves Brussels for Sierra Leone, he must be told in no uncertain terms that after eight years of corruption and misappropriation of hundreds of millions of dollars – exposed every year by the Auditor General, international aid and financing will stop, until serious and meaningful reform of the country’s governance and public finance management structures are carried out.